Take a look at the stats above: Seriously, click on the image and blow up the image, so you can read it. The stats are video game ridiculous—they don't seem real. But they are. Sandy Koufax earned them. Stats are all my generation—and the generations that followed—have to go on with Sandy Koufax. But the stats are remarkable. And while the '60s were notorious for being a pitcher's decade: with guys like Denny McClain, Bob Gibson, Don Drysdale, and Juan Marichal putting up absolutely dominating numbers. And the hitters had to endure as best they could. For instance, the AL 1965 MVP, some guy named Zoilo Versalles with a .274 BA, 19 HRs and 77 RBI. Definitely a pitcher's decade. But still that means nothing. Sandy Koufax, even in an era of pitching dominance was in a class by himself. The most unlikeliest of dominators—soft-spoken, shy, bookish—yet, on the mound, Sandy was all business. Even ruthless. Here's just a few of his career stats. 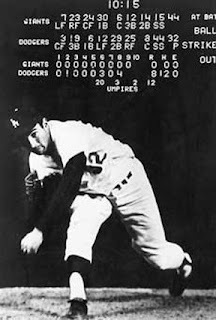 The 1st person to win the Pitcher's Triple Crown twice since 1937, Koufax did it 3 times between 1962 and 1966, and only injury likely prevented him from winning a 4th. In those years, he had a cumulative 2.02 ERA, a .926 WHIP and averaged 288 Ks a season. In 1963, he had 11 shutouts. The last time anybody had double digit shutouts was in 1985. Last year, Tim Lincecum, Joel Pineiro and Zack Grienke led the MLB with 2. Roy Halladay—known for being a hoss, innings-eater kind of pitcher has 12 shutouts. For his career. Koufax was the first pitcher to win multiple Cy Young Awards, as well as the first pitcher to win a Cy Young Award by a unanimous vote. And all 3 of his Cy Youngs, he won unanimously. But what makes Koufax's numbers even more astounding is that for a good chunk of his career, Koufax played with arthritis in his elbow. And while it hurt him every day, and especially while pitching, Koufax never complained to anyone. His arm once turned black and blue from hemorrhaging during the night. Oftentimes he wouldn't be able to straighten it and it would swell to the size of his knee. Years later, doctors eventually discovered that Koufax stretched the ligament in his arm so much that it allowed two bones to rub together. " He must have been dying from pain." a doctor would say about his condition. 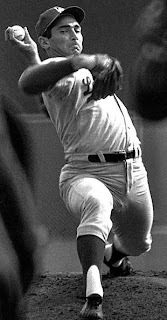 As a result of his pined elbow, Koufax tipped off his pitches, keeping his elbows in different positions during the windup depending on which pitch he was going to throw. Didn't matter. Even knowing what pitch was coming, they couldn't hit it anyway. For the rest of his career, Koufax would have to take a battery of drugs just to keep playing. Despite the arthritic elbow, Koufax pitched 3 times in 8 days and both games 5 and 7 of the 1965 World Series. In game 7 his arm hurt so bad, he couldn't throw a curveball—so he just used his fastball the entire game. Both game 5 and 7 were shutouts. His last season, 1966, Koufax was told not to pitch another season, or he might lose his arm. He did, one last time, and put up a 27-9 record and a 1.73 ERA. After the season, Koufax retired at age 30. "I don't regret for one minute the 12 years I've spent in baseball," he said, "but I could regret one season too many. "In 1972, at age 36, Koufax was the youngest player ever voted into the Hall of Fame. Years later, Vin Scully recalled, at a charity golf event, a pro golfer said to Koufax that he would shoot better if he straightened his arm on his follow-through. Koufax replied, "If I could straighten my arm, I'd still be pitching." By that time, Koufax had had surgery on his neck, back, both knees and his shoulder. Maybe it's because he's a Brooklyn guy like me. Maybe its because, in America in the 1960s, he was second fiddle to Drysdale (Koufax was shy and Jewish, Drysdale was blond and blue-eyed and outgoing) and I always appreciate guys who are maybe a little left-of-center. Or maybe because so many guys who saw him pitched all used the same words when talking about him. "He just blew hitters away." "He had movement on his pitches like you couldn't believe." "He was the best." But since I couldn't see him, I watch videos of him over and over. And you know what? The old guys were right. He blew people away with his untouchable fastball, then dropped his sick curve like a bomb on them. Go to 1:20 of the 2nd video video to see his curve. He was one of the best, if not the best lefty of all time. And while the videos are great to watch, man, do I wish I could have seen him play. For the amount of time it took you to write this post, you could've made good headway on building a time machine. You're welcome for the idea. Just remember to invite me along for the trip when it comes to fruition. I grew up in Van Nuys and I saw my first game on April 28, 1962. Sandy Koufax beat the Pirates and I was mesmerized. He was my hero from that day forward. He truly was the greatest and has never been equaled. His power and dominance was so unbelievable. His windup was so awesome, he came at the hitters with so much force. When he retired in 1966 I was completely devastated. I have been waiting over 40 years for another Koufax, but no one has taken his place. Like MJ or Tiger, these guys only come along once in a lifetime. Great work with you post.